It’s a bright cold day in the austral midwinter. The low sun is dropping into the lake, drawing long shadows from the dead trees, broken streetlights, and bent telephone poles that stick out of the water as if planted there. Three flamingos are floating down the Avenida De Mayo, past the half-sunken ruins of the Azul Hotel. Their pinkness almost glows against the dry white crust that covers every exposed surface. It looks like ash, or frost, but is actually salt. There is 10 times more salt in this water, per cubic centimetre, than in any of the world’s oceans. 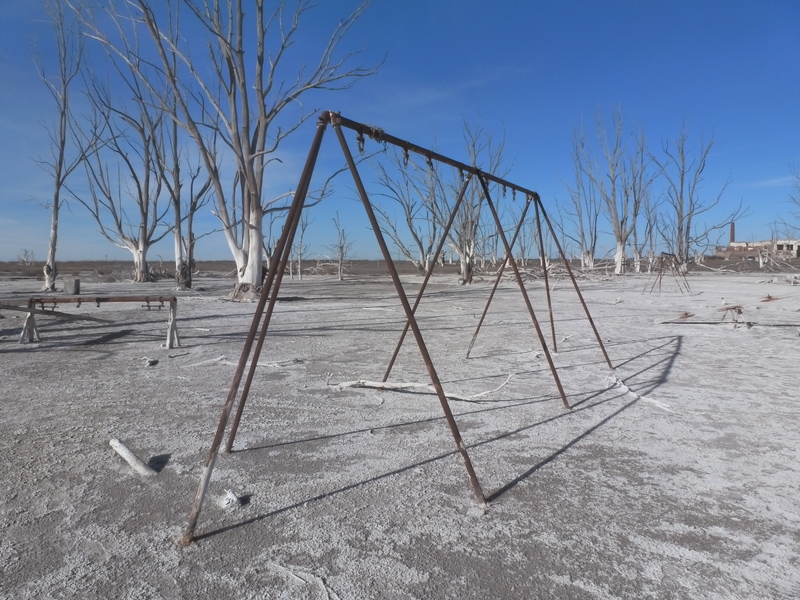 The lake was named “Epecuen” by the Mapuche tribes who once populated the surrounding lowlands of central Argentina – it was their word for the itch caused by the salt drying on their skin, though they also found that it had health-giving properties. By the late 19th century, encroaching Europeans had made the same discovery, and were bathing here to relieve their own skin complaints and circulation problems. Hotels, shops, and restaurants were built along the shore to cater for wealthy visitors from Buenos Aires, many of them Jewish emigres who made the place a substitute for the Dead Sea. The resulting boomtown prospered from the early 1920s until mid-November 1985, when the lake rose eight metres in eight days of rain. The flood happened slowly enough to evacuate but too quickly to defend against. 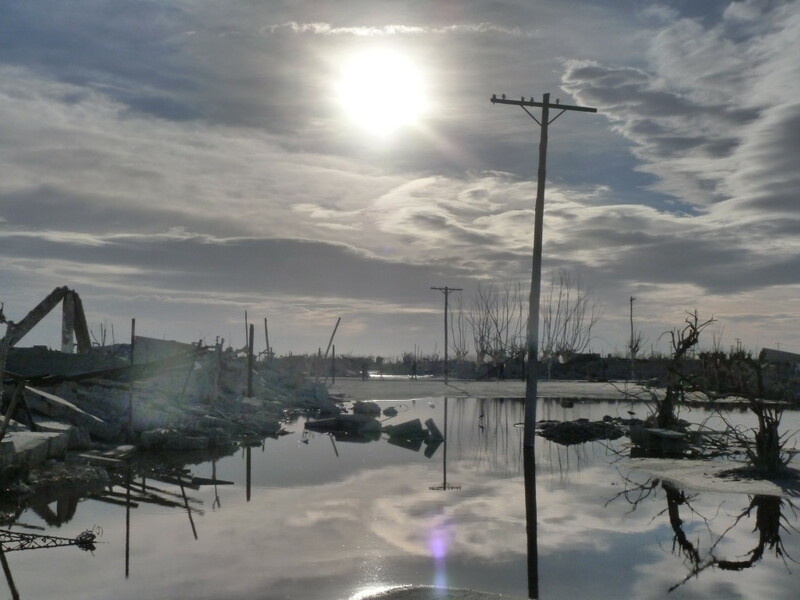 Epecuen was drowned, and spent the next quarter-century at the bottom of the lake. Then, a few years ago, it started to resurface – largely wrecked but partly preserved. The town centre has since dried out, and debris has been cleared to make the main streets walkable again, though every avenue running south still vanishes into the water. Visitors are now coming from across Argentina to see this small-scale Atlantis of the Pampas, and in that sense, Epecuen is once more a tourist attraction. Former residents have mixed feelings about this. “It’s a delicate situation,” says local historian Gaston Partarrieu, director of the regional museum in the neighbouring town of Carhue, which became home to the majority of Epecuen’s displaced population after the flood. “A lot of people think it would be very easy to bring in money by promoting the ruins as a destination. 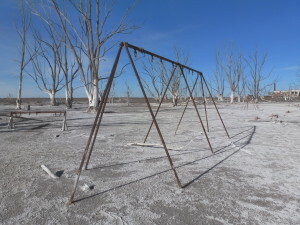 But many others who made their lives in Epecuen find it too painful to see the place as it looks now, and they don’t really like the idea of strangers taking pleasure from it.” Partarrieu has sympathy for both sides of that argument. His own town has also been subject to severe floods, and owes its continued existence as much to tourism as to its original business of farming. Standing in Carhue’s main plaza, across from his French deli (which happens to be the best food option within about 500 kilometres), he tells us that all this was submerged as recently as 1993. The town’s recovery was heavily subsidised by wealthy retirees from other parts of the country, who were specially bussed in to make use of the area’s thermal baths. According to Partarrieu, that flood also caused a “political revolution”, as locals blamed it less on the rain than on the government, for failing to complete the half-built, long-abandoned canal project that might have saved Epecuen and prevented later damage to Carhue. When finally finished, that improved drainage system had the ironic effect of reducing Epecuen Lake and raising the former resort in its spectral new incarnation. Partarrieu does not deny the strange appeal of the place as it now stands. “I understand why people want to come,” he says, “but they should be aware that there are still strong feelings around here, especially for those who lost everything.” The flood itself killed no-one back in 1985, but it covered the old town graveyard faster than residents could salvage the remains of their loved ones, and coffins were seen floating away. Since the cemetery re-surfaced last year, those relatives have been returning to lay fresh flowers, repair headstones, and write new inscriptions that read like apologies. Having started there, our walk through the town itself feels duly funereal, and there’s an instinctive pathos to crossing a salt-blasted children’s play park that looks like an atom bomb test-site.